The Intergovernmental Panel on Climate Change (IPCC) is an international scientific collaboration - the largest of its kind - established under the auspices of the United Nations. It was founded in 1988 under the World Meteorological Organisation and the United Nations Environment Program, and later endorsed through the UN general assembly. The IPCC serves to systematically review and synthesise the current state of knowledge regarding climate change, and thus represents the benchmark of the scientific consensus. Work for the IPCC is on a voluntary basis, but caries a lot of prestige in the scientific community. The consensus has been steadily strengthening as scientific evidence accumulates - and of course, as the climate warms, confirming and refining climate models. The First Assessment Report (FAR; 1990) found that greenhouse gases were 'capable of' warming the climate. In 1995's Second Assessment Report (SAR), this was upgraded to a 'discernible influence'. By the TAR (2001), this became 'likely due to human activities'. AR4 - the naming convention changed, since 'FAR' was taken by the first one - further upgraded this to 'very likely'. Then the first part of AR5, released last year, again upgraded this to ‘extremely likely’. The IPCC is formed of three working groups, each of which produces a report. Working Group I deals with the physical science basis, Working Group II deals with impacts and adaptation, while Working Group III deals with mitigation (avoiding climate change). Once all three reports are out, a Synthesis Report is also produced. Monday's report was from WGII, the working group that most heavily draws on economics, and is therefore the most open to social criticism (we touched on this in 'Let them eat growth').1 Before we discuss the WGII AR5 report, we'll briefly highlight two well-established criticisms of the IPCC. First, as a consensus-based body, the IPCC is inherently conservative. The 'Summary for Policymakers' in each report has to be agreed line-by-line by representatives of each participating state (typically more than 120). While this avoids controversy, it also neglects outlying views and, due to submission deadlines and lengthy process, excludes the latest research. As the latest research tends to be worse news, the consensus tends to be on the conservative side, and lag behind the cutting edge.2 For instance, the IPCC has consistently underestimated sea ice loss, with the real figures tracking beyond the lower limit of the projected range. 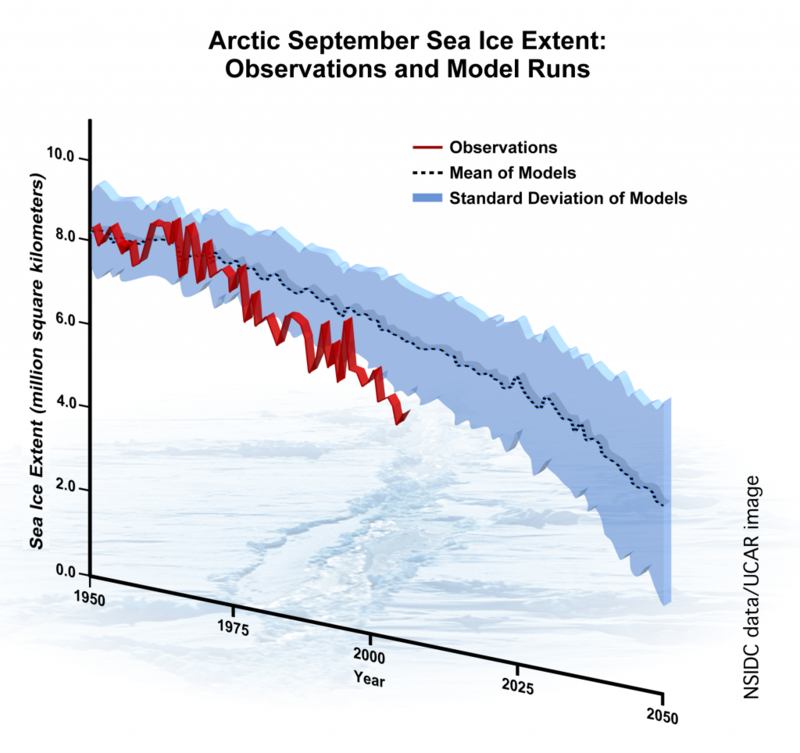 Arctic sea ice projections (blue) and observations (red). Source. Unfortunately, because many people think if you have a budget you should spend every last dollar, the "carbon budget" message could be interpreted as saying there is plenty of budget left to spend. However, these general criticisms shouldn’t take away from the fact the IPCC’s reports are the most important pieces of climate science literature, synthesising a vast amount of published research. Having read through the Summary for Policymakers of the latest report (SPM – the full report is not available yet), five things stand out. …indigenous, local, and traditional knowledge systems and practices, including indigenous peoples’ holistic view of community and environment, are a major resource for adapting to climate change. 2. Five ‘Reasons For Concern’ (RFCs). AR5 WGII distils the bad news of climate change impacts into five key points. While the buzzfeed brevity is clearly aimed at policymakers’ desire for executive summaries of executive summaries, this does summarise a huge, complex body of literature. The five RFCs are: unique and threatened systems (particularly Arctic sea ice and coral reefs); extreme weather events (including heat waves, extreme precipitation, and coastal flooding); distribution of impacts (particularly regarding crop production and uneven development); global aggregate impacts (the economic and biodiversity impacts of numerous combined trends); and, large-scale singular events (specific impacts associated with crossing irreversible tipping points, such as ice sheet loss and subsequent sea level rises). For this, the IPCC has been accused of ‘alarmism’, but if it’s alarming, that’s because the consequences of business as usual are really that bad. If anything, the RFCs are framed in very dry technocratic terms considering they describe war, famine, drought, mass displacement, and ecosystem collapse. In addition to this, Beverly Silver’s analysis of the auto sector has demonstrated comprehensively that locally improving conditions have been closely linked to the level of class struggle. That said, the report stresses that climate change will disproportionately impact the already poor and marginalised, so the headline conclusion that climate change is bad news for poverty reduction stands. 5. Resilience. Finally, the report gives a useful definition of resilience, a term which is becoming increasingly contested. The capacity of social, economic, and environmental systems to cope with a hazardous event or trend or disturbance, responding or reorganizing in ways that maintain their essential function, identity, and structure, while also maintaining the capacity for adaptation, learning, and transformation. The term comes from ecology, but is undergoing significant recuperation and incorporation into state policy. This definition shows why: states stress the conservative aspect of ‘maintain their essential function’, whereas ecologists (and maybe radicals) stress ‘the capacity for adaptation, learning, and transformation’. One critic points out how the state use of resilience amounts to insisting that we continuously put up with bad things, essentially ‘keep calm and carry on’. But this recuperative meaning does not exhaust the concept, and the capacity for social transformation under adverse conditions is surely central to the question of climate change. …US Secretary of State John Kerry has been warning that climate change inaction will be catastrophic – while the US pushes ahead with the Keystone XL project to further ramp up unconventional fossil fuel production. Statesmen see catastrophe on the horizon – and accelerate. No mountain of scientific consensus will change that, only the blocking of fossil-fuel based development. 1. Richard Tol, who we criticised in 'Let them eat growth', asked for his name to be removed from AR5 WGII, accusing the IPCC of 'alarmism'. More generally, we're assuming a critical realist stance here: scientific knowledge is socially constructed but relates to a reality which is independent of human thought. The physical sciences certainly describe this reality and thus have a good claim to universality, whereas economics tends to confuse/conflate features of specifically capitalist society with universal facts of nature. This is not to say physical science is beyond social critique (we'll discuss this in future blogs), only that in critical realist terms, the object of the physical sciences is intransitive (independent of social construction), whereas for economics it’s transitive, since economics deals with social relations and emergent social forms. 2. Some see this as a strength however, as only well-established research is included, giving time for misleading results to be found out and shaky conclusions to be criticised. 3. This is not to say discount factors are not useful. They can model economic actors’ actual behaviours: indeed, corporate actors especially do operate on a very short-term horizon - that’s one reason we’re in this mess. The problem comes when there’s a circular movement between the descriptive and normative domains: when what is the case is used to determine what ought to be the case. 4. It should go without saying the UN’s take on class is not Marxist or libertarian communist. 5. In other words, acknowledging that inequality exists is not the same as analysing the power relations which (re)constitute it. 6. For an example of critical intersectionality, see Jasbir Puar’s argument that limited inclusion – e.g. gay marriage - for ‘homonationalist’ gays has simultaneously meant the exclusion and pathologisation of the Muslim ‘other’ in the War on Terror. In a specifically climate change context, Adrian Parr’s Wrath of capital is a good example, insisting on the importance of class relations without excluding analysis of gender, race, and other social forces. 7. Piketty is a social democrat who likes to stress that Marx was wrong, but he has assembled a vast amount of useful economic data (which suggests otherwise). The IPCC has been accused of ‘alarmism’, but if it’s alarming, that’s because the consequences of business as usual are really that bad. So, it turns out Richard Tol is on the advisory council for Lord Lawson's Global Warming Policy Foundation, the main UK climate change denialist lobby group. Interestingly, one of the things the IPPC report is being attacked in the press for quoting some papers which contain errors. But the errors in question were introduced by one Richard Tol, in his capacity as a coordinating lead author, before he stepped down. The IPPC has released a statement to this effect. So it looks like he has direct links to climate change denialism (possibly financial? ), and actively sabotaged the IPCC's work by getting involved, introducing errors, then withdrawing and attacking the IPCC for on the one hand not accepting his results ('alarmism!') and on the other hand for referencing his papers which apparently contain errors!